Profit margins in the food and beverage industry worldwide are notoriously thin, and the Asia-Pacific region is no exception. According to statistics portal, Statista, they generally hover between 6% and 8%, depending on whether it’s a quick service, fast casual or full-service restaurant. Either way, there isn’t much room to maneuver, so any activity that adds to the bottom line is welcome in this highly competitive industry. The standard ‘go-to’s’ for any restaurateur to increase margins has always been upselling and cross-selling. Because these terms sound similar, people often get confused, so it’s important to clarify the difference. In the F&B industry, both are important sales techniques. Upselling, in particular, compounds profit by using the momentum of the purchase. If a customer has already decided which dish they would like, a prompt to add value to the order is often well received. Restaurant studies have repeatedly shown that when presented with an appealing offer related to their current order, a majority of customers will purchase the upsell item. The challenge for any upsell is to present it in such a way that it doesn’t come across as a hard sell. Done well, it should be seen as a customer service, presented in a subtle way to avoid annoying the customer or making them feel pestered. By adding value to the experience, you will not only increase your average item and order values but also build customer loyalty. Technology is playing an increasingly important role in the F&B environment and has been shown to boost upselling, particularly with QSRs. One example is Sushi Tei, a leading restaurant chain in Singapore and across Asia. Sushi Tei implemented TabSquare’s SmartTab solution in late 2016 and have seen a significant boost in their key profitability metrics, including a 10% increase in average item value and a 5% lift in average order value. One of the strongest contributors to these results has been TabSquare’s AI-powered smart upsell capability. 1. Know your most profitable menu items. It makes sense to upsell those items that maximise your profit. This means having the data and insights to identify the items with the highest margins, training your wait staff on these and entering the details into any technology you use. 2. Know what items to upsell, when. The psychology of dining is sophisticated and, like most things in life, timing is everything. Understanding the right time to prompt for an upsell will increase the likelihood a customer will accept it. 3. Don’t annoy your customer. As mentioned earlier, there is a fine line between suggesting a value-added upsell versus a pushy hard sell. A smooth, well suggested upsell leaves a diner feeling like a valued customer, while a bad experience can make them uncomfortable and upset. In this case, you lose twice: once from a missed upsell opportunity and a second time from damaged customer loyalty. 4. Suggest a course your customer hasn’t ordered yet. Persuading your customer to order every available course will increase your profits. Experience shows they will be more likely to order an extra course if it’s presented to them at an appropriate time. Suggesting items that are commonly paired also increases the chances of a successful upsell. 5. Describe any upsell options. To help convince your customer to purchase an upsell item, it’s important for them to see, smell and taste the dish in their mind. 6. Use marketing and promotions. Human beings are visual creatures who thrive on communication, so it’s important to connect with your customers both when they’re in-venue and after they’ve left. This means having marketing and promotional campaigns well-planned and the channels to reach your customers. 7. Train your wait staff regularly. As the ‘face’ of your restaurant, your servers are a vital connection point with your customers and a valuable tool for upselling. It’s important they know what’s on the menu, the most profitable items and the specials on offer. They also need to be trained on the best timing and what to say to optimise acceptance. 8. Use technology. The above points place a heavy reliance on the wait staff. In a busy restaurant or café, trying to remember a detailed menu, specials, promotions and most profitable items is a big ask. That’s on top of serving customers, remaining enthusiastic after a long shift and trying to be at the table at the right time to prompt with an upsell. QSR Media quotes a study on suggestive selling done with 39 coffee franchises. It found that 59% of staff members didn’t attempt any form of upselling to customers, with only 5% asking if a customer wanted to upsize their beverage. This illustrates the value of AI-powered cloud ordering platforms like TabSquare, which can lift the burden of upselling and cross-selling from staff, freeing them up for more valuable customer interactions. Food and beverage software solutions company TabSquare offers cutting-edge technology that deals with many of the challenges faced by the F&B industry, including optimising upsell and cross-sell opportunities. The Singapore-based startup, which has offices in Australia, Indonesia, and India offers a solution that extends POS and payment systems to provide a more engaging and satisfying dining experience to clients across Singapore, Australia, Malaysia, Indonesia, and Thailand. 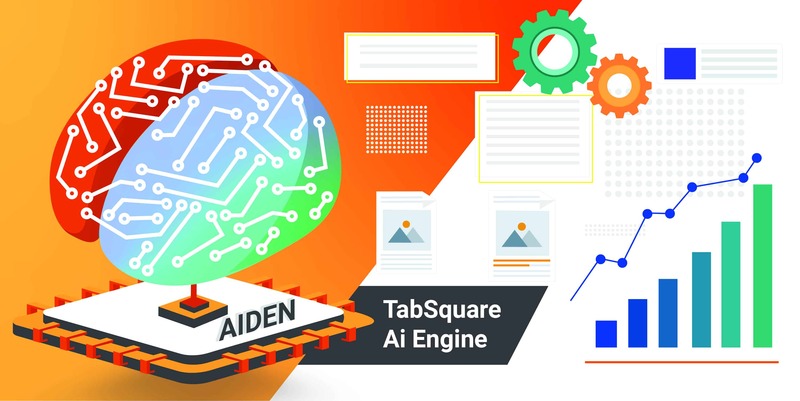 Through its artificial intelligence (AI) engine, nicknamed Aiden, TabSquare helps drive restaurants’ profitability by creating seamless operations, saving labour costs, boosting average cover value and speeding up table turns. TabSquare’s solution acts as a virtual assistant, guiding and advising customers throughout their dining experience. As shown in the Sushi Tei case study, it can simultaneously lift average item and order values and also speeds up table turns. It boosts upselling by crossing off many of the points highlighted above. Through its insights and analytics capability, it knows instantly the most profitable menu items and automatically prompts customers with these at exactly the right time in the dining cycle. It also recommends pairings based on the previous behaviour and presents any specials or promotional items. TabSquare’s solutions also carry high-quality imagery, together with detailed descriptions of each dish and its ingredients. This adds a level of detail that is impossible for wait staff to remember or communicate. And, by removing the potentially annoying ‘human’ factor, the technology is potentially less threatening or annoying, which boosts the chances of upselling acceptance. This reduced reliance on wait staff means you can cut back on staff numbers and fine-tune shifts better, which lowers overall staff costs. It also means new staff members can get up and running far quicker, without having to go through intensive training on every aspect of the menu. The focus instead can be on improving service in the reduced volume of face-to-face customer interactions. TabSquare’s SmartKiosk has some great innovations driven by it’s AI engine, nicknamed Aiden. Its software has a ‘ ForYou’ section for each customer, which is triggered when they log in. It automatically notes the customer’s previous behaviour and cross-checks this against the venue’s sales, then suggests upselling options. It can, for example, calculate that sales have been good on a particular day and offer an upsell or cross-sell for a lower price than if sales had been slow. This encourages the customer to enjoy the promotion – which has been created on the fly – something which is impossible in a traditional ‘old school’ restaurant environment. It also offers custom recommendations. If, for example, a customer orders spicy food frequently, TabSquare will recommend other high margin spicy food items. If the customer, say, regularly orders spicy chicken wings, the AI-powered ordering system will recommend an upsell to a spicy food platter, enticing the customer to spend more. Find out how TabSquare’s cloud ordering platform can help your restaurant or café deliver a seamless dining experience with maximum upsell and keep your customers coming back for more. Join other F&B businesses that are seeing significant benefits from the latest that technology has to offer. Download our case study to find out how.